My husband and I left the confines of the city to spend two weeks in the "Land of Smiles" for our honeymoon and it only took us 20 hours to get there. We prepared for our little adventure watching YouTube videos, taking advice from friends and relatives, and reading books about the tropical paradise. Our journey started in Bangkok. After a goodnight's rest, we were ready to hit the town. 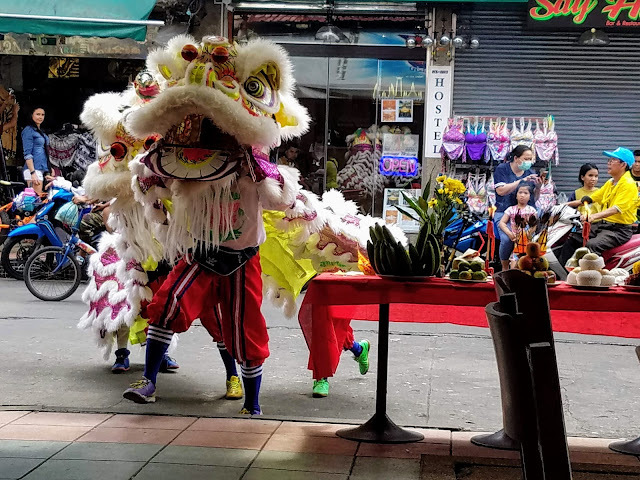 We filled up on tropical fruit and omelettes for breakfast and started exploring the neighborhood by our hotel (Ibis Styles Bangkok Khaosan Viengtai). It was right in the middle of all the action...DAY and NIGHT! Walking through the streets of Bangkok felt like Deja vu. The streets, sounds, and smells were all too familiar. I guess because we both have walked through hustling and bustling streets in our own home countries to know this was no different. It was nice. We were about to cross Khaosan Rd when we heard music and these beautiful ladies in gold colored saris and jewelry dancing in the street. 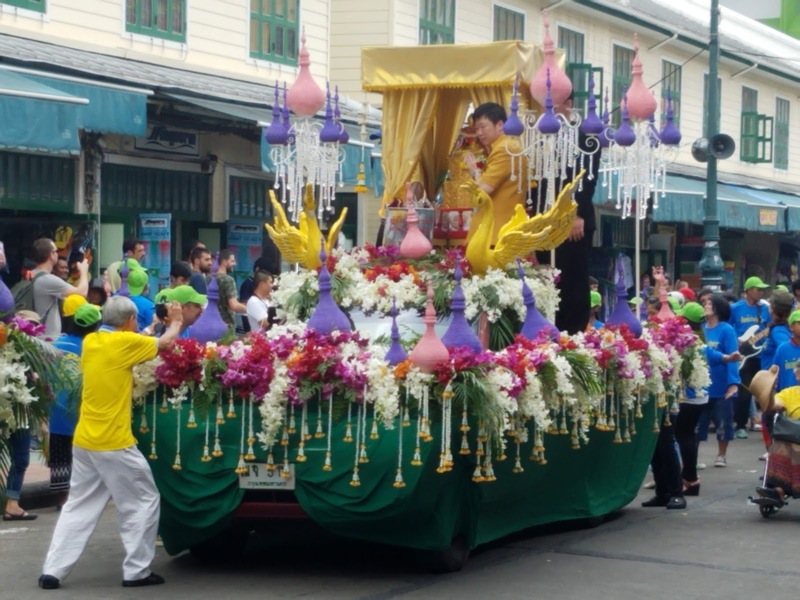 ... and then a float which was adorned with lots of colorful flowers and at the top of the float was a Buddha statue. It reminded me of an Ūrēgimpu or parade that I've seen in Andhra Pradesh. Except this was more for religious purposes. The people on the float were handing out trinkets as blessings to followers and local business people. The only other time I've witnessed this kind of parade outside of India was during Lunar New Year in Chinatown, NYC. The local martial arts school students dress up in lion or dragon costumes and perform dances around the town. They go from business to business collect money and give blessings. It was fun to watch. Inspiration can come to you at any given time...when you're dining at your favorite restaurant and you get a whiff of the dish that's passing by. When you are roasting a blend of spices and the aroma of these spices hits your nose just right and you think of your next dish. It can also happen when you open your fridge and see the ingredients laid out in front you. I'm pretty sure the last one is what inspired my mom to make I will be talking about today. 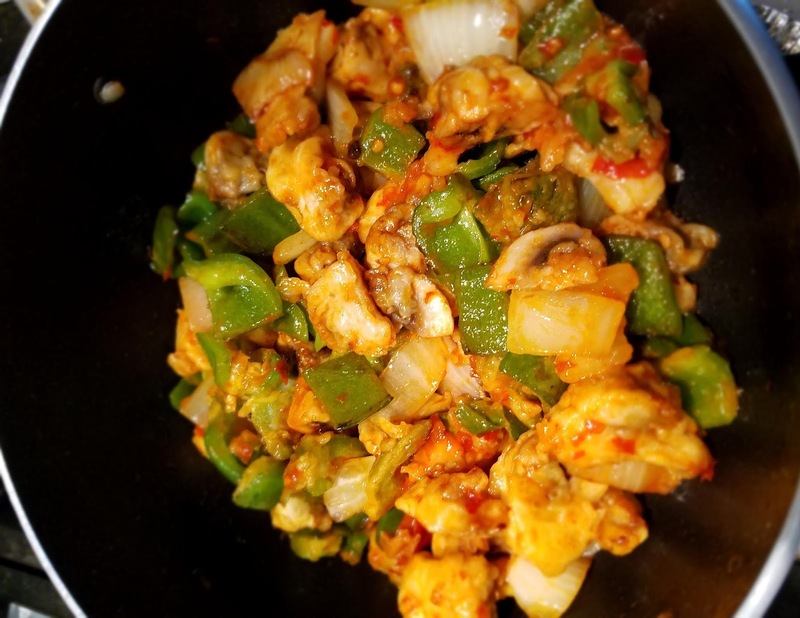 My mom likes Indo- Chinese cuisine; some dishes that she likes are Cauliflower Manchurian, Chili Paneer, and Szechuan noodles with vegetable stir fry. There are restaurants in my hometown that specialize in this cuisine but we can't go there all the time. 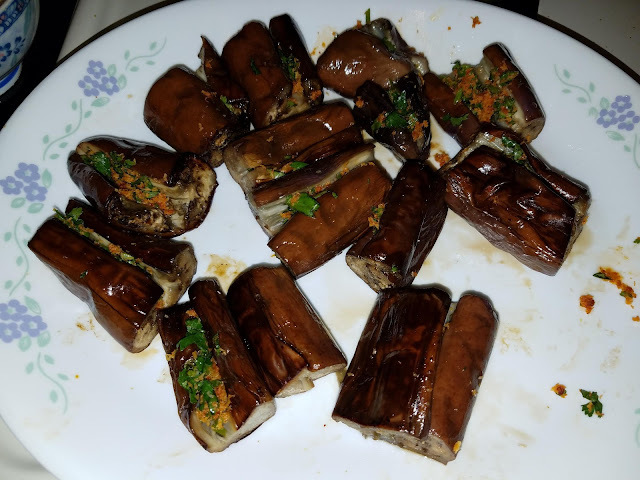 Whenever we like a dish, we try to re-create it at home. She likes the idea of vegetable tempura where the vegetables are lightly battered and fried. 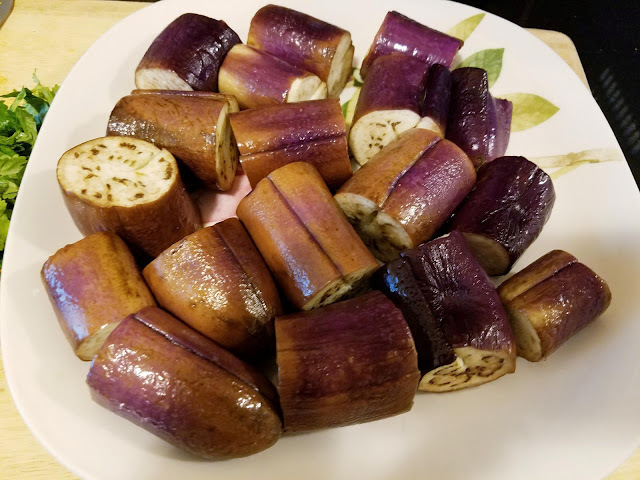 You can still taste the vegetable inside and it's crispy. She also likes the various sauces in Chinese cuisine that are spicy and salty. However, these sauces aren't always made with vegetarian ingredients. That's when she discovered Ching's Secret products. 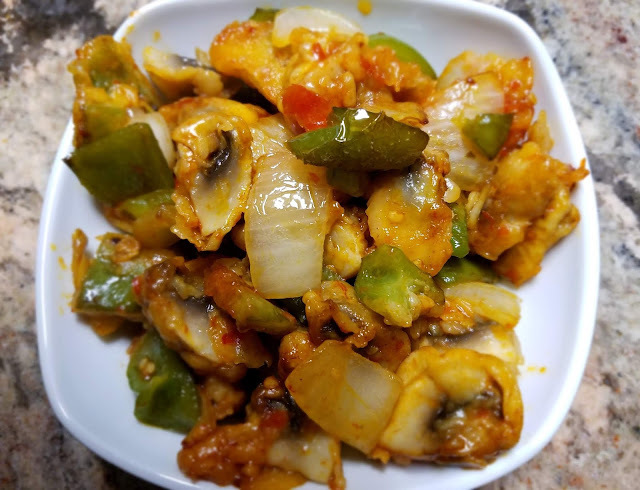 Ching's Secret is an Indian brand of Indian Chinese cuisine with a product portfolio which includes instant noodles, instant soups, Desi Chinese masala, sauces and Schezwan chutney. With vegetables: white button mushrooms, bell peppers, and onions...and the Ching's Secret Schezwan sauce in hand, she sprang into action to create something yummy. 1) Toss the sliced mushroomed into the flour mixture or batter. 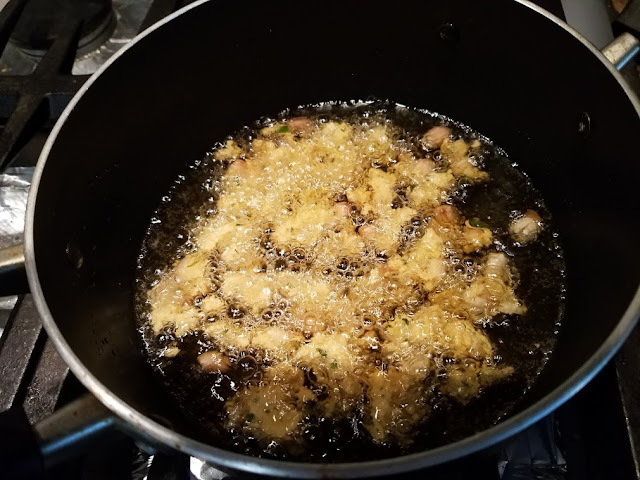 Heat oil in a saucepan on high to low medium flame and add the flour coated mushrooms into the oil, ensuring they lay flat in small batches. 2) Fry them for 5 minutes turning them over intermittently. 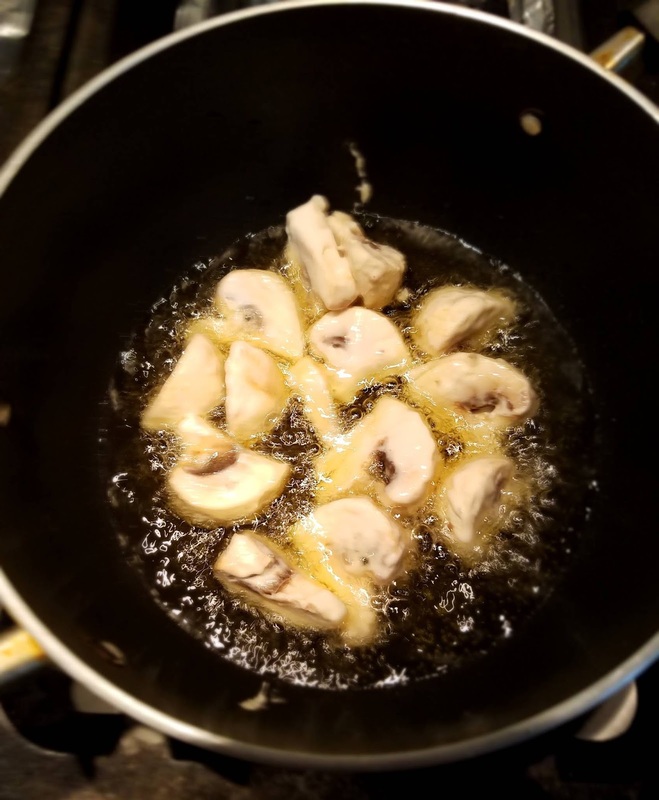 When the mushrooms turn slightly brown, remove them from the oil and set aside. *Helpful hint: Let the mushrooms cool in a bowl covered with paper towel so it can absorb the excess oil. 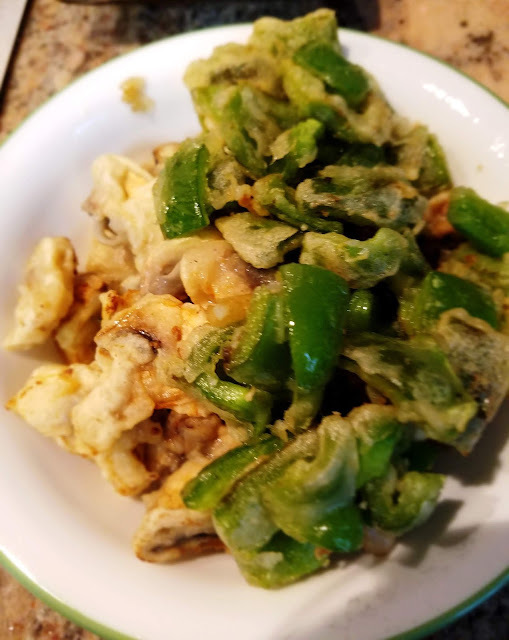 Then, add handful of bell pepper pieces in the remaining batter and fry them too. Transfer the fried pieces into the bowl as well. Next, add the remaining bell pepper and onion into the oil and fry them lightly on medium to high heat. When they start to brown lightly, remove them and add them to the bowl with the other fried vegetables. 3) Transfer the remaining oil and bring back the pan to the stove with medium heat and add all the vegetables, the Szechuan sauce and two pinches of salt. Mix well and stir fry with sauce for 3 to 4 minutes. 4) Transfer into a serving dish and garnish with chopped scallions. 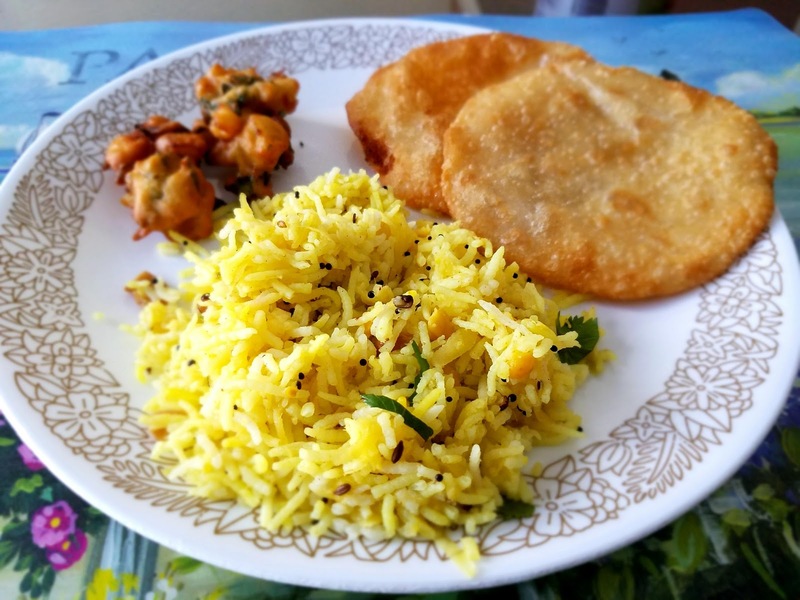 This dish can be served as an appetizer or as a main dish with brown rice. We love re-creating dishes we tried when we go out for dinner. We can add our own little touch to them. We are so fortunate to have brands like Ching's Secret that make it easy for us to experiment with new cuisine. A low calorie and gluten free version of this recipe can be done by skipping the tempura frying with all-purpose flour. Quickly stir fry the veggies in 3 tablespoons of oil on high heat with a pinch of salt and toss them further with the Schezwan sauce. It Started with a Celebration! I love Indian festivals!! They are a reminder for us to be thankful for what we have and be hopeful for what we can achieve in the future. Last Friday, we celebrated with good food, friends and family. 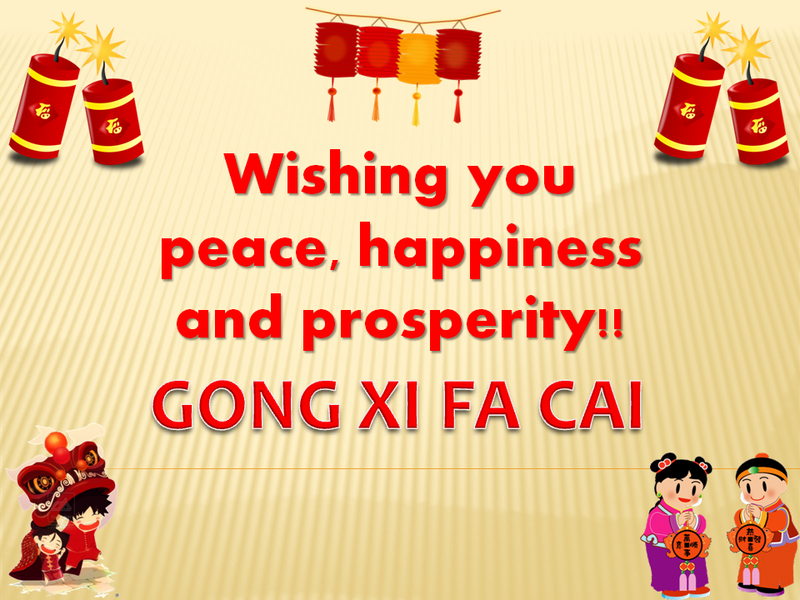 Here's to many more occasions to celebrate with our loved ones!! I can't believe there's only one dosa restaurant in all of Brooklyn! One?? That's so disappointing. What's worse is that, there's at least half a dozen North Indian restaurants in this area. I rather eat hot and crispy dosas over Chicken Tikka Masala any day. The "dosa heaven" I'm referring to is about the dosas I made at home. My husband and I decided to stay at home and clean this Labor day weekend. I made dosas as a reward. I made them using the homemade dough my mom gave me when I lasted visited their place. MOMS think of everything!! 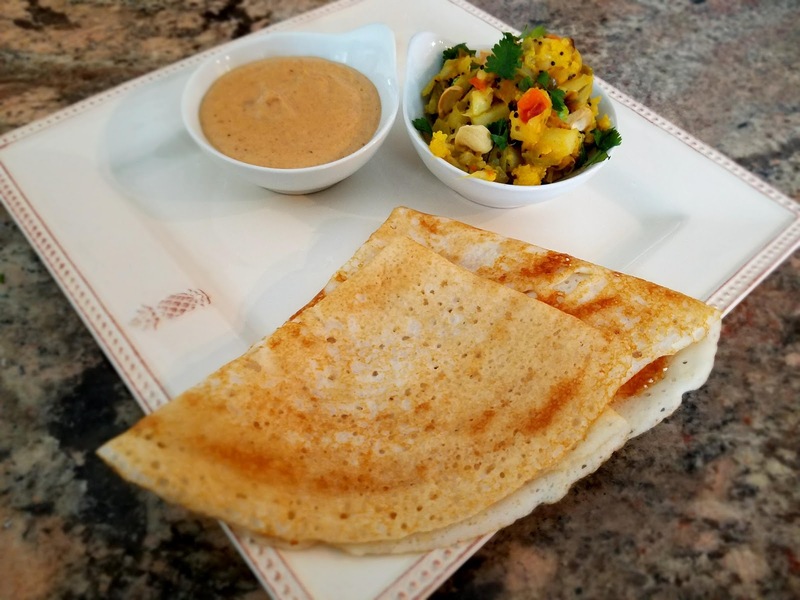 What better way to enjoy dosas than with dosa chutney and potato curry. Dosas would be naked without them. I never understood why restaurants always served dosas with coconut chutney but not peanut chutney. They don't even have peanut chutney as an option. Is it because of allergies? 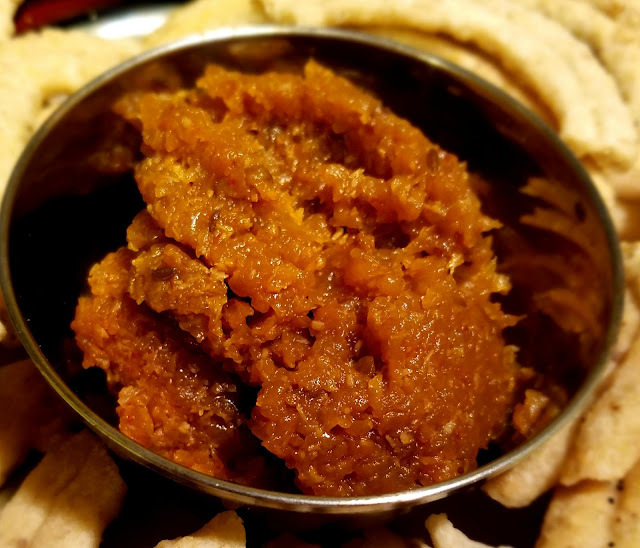 Peanut chutney is only made at home. Why isn't it served outside of the home? It's not like it's difficult to make. The chutney consists of peanuts, tamarind, dried red chilies, salt, brown sugar and oil. In my opinion, coconut chutney is only good with idlis not dosas. What do you think about the potato curry served with dosas at the restaurants? I never liked it; it's tasteless and lumpy. My mom makes the potato curry with mixed vegetables so you're not just eating POTATO. 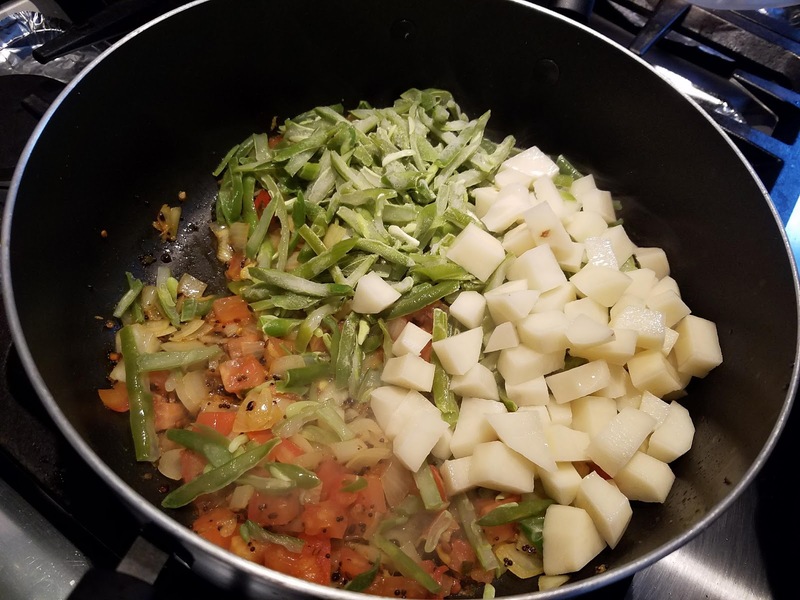 Besides potatoes, she also adds cauliflower, French cut beans, carrots and peas in her recipe. It's a healthier version. 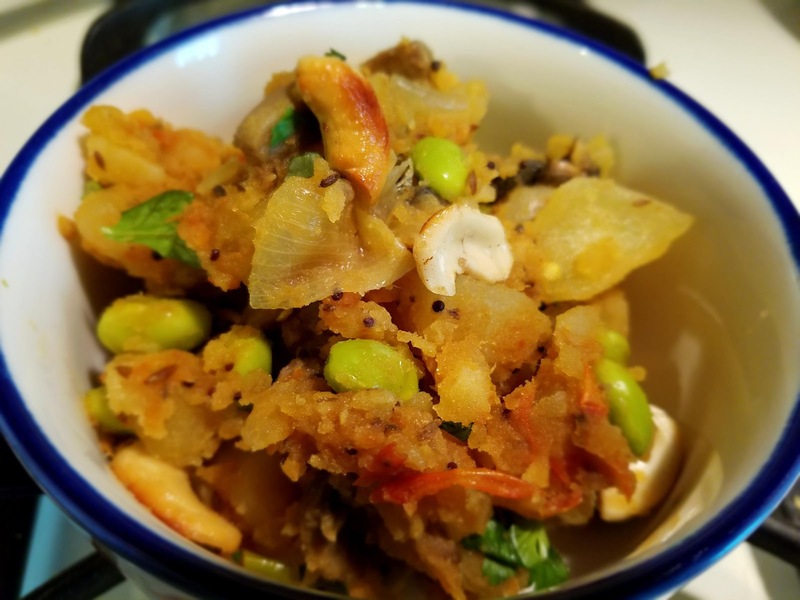 I didn't have all the vegetables from her recipe, so I improvised and used: baby bella mushrooms, soy beans and cashews in with the potatoes. It turned out well and my husband liked it so it's a win in my book. I hope to see more dosa places pop up in my area. The Brooklynites are missing out on our cuisine and culture. 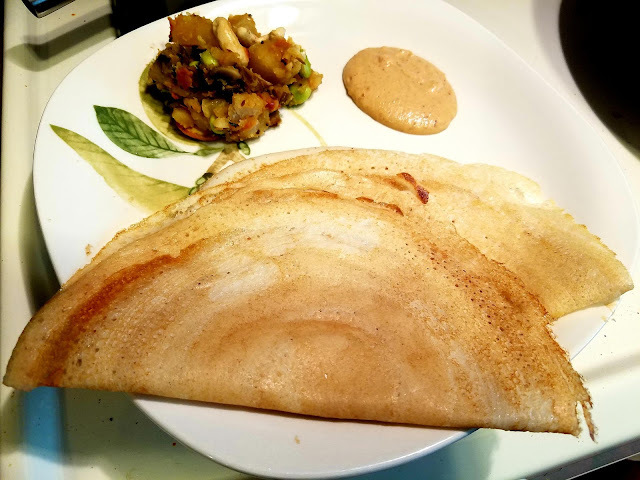 What is your "dosa heaven"? Which do you prefer: peanut chutney or coconut chutney with dosas? We would love to hear from you. Still thinking about the pesarattu waffles my mom and I made last year with our waffle maker from Costco. Pesarattu is a type of dosa made with lentils. Instead of making it the traditional way, we kicked it up a notch and used the dosa dough to make WAFFLES!!! We used our stone grinder and ground the soaked moong dal and rice to a smooth consistency (consistency of dosa dough). Once the dough is prepared, it's time to make the waffles. As you will see in the video, we applied oil on the waffle grooves and then poured the lentil and rice batter. Make sure to evenly spread the batter in the waffle maker. (Please see video for details). The waffles can be enjoyed on their own or with your favorite chutney. How do you use your waffle maker? 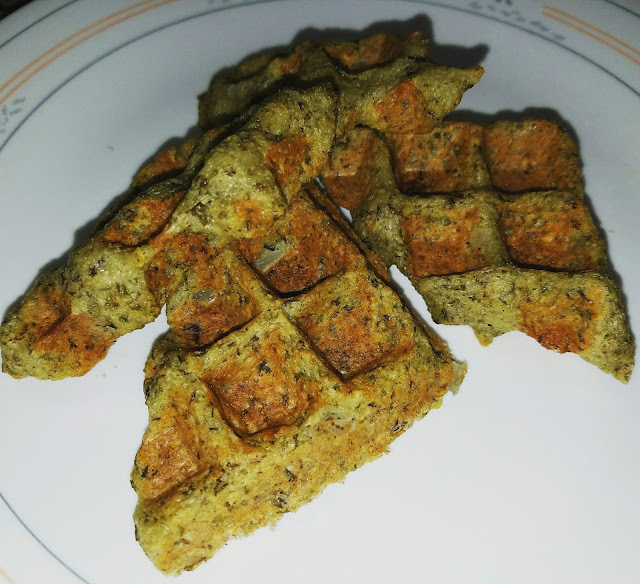 Do you make savory waffles too? Please share your comments with us. Gardening is bliss! When we're not busy coming up with new dishes, my mom and I are tending to our garden. We love planting and watching them grow. Since moving away from home, I've started my own garden. This year, I planted cherry tomatoes, bell peppers, gongura and various herbs. It's very relaxing and nurturing. One of the plants I'm very excited to see flourish is the gongura plant. We use the leaves to make a fresh pickle which we mix into rice and enjoy. Feast your eyes on this "fresh from the garden" pickle. 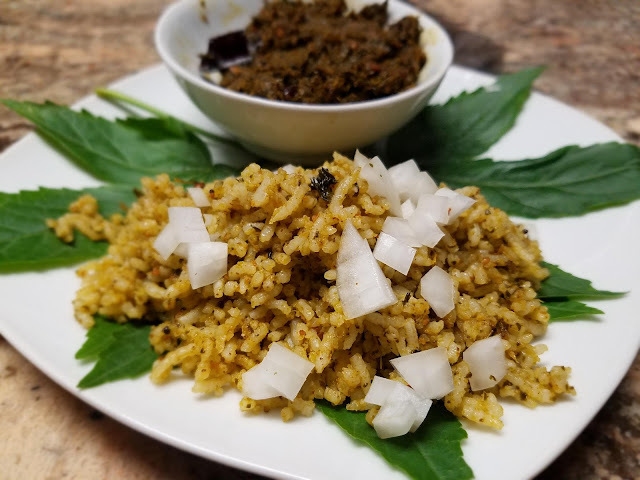 Dishes made with Gongura leaves are popular in the Andhra Pradesh and Telangana (southern states of India). There are two varieties of Gongura: red stemmed leaf and green stemmed leaf. My mom and I grew the green stemmed variety which is not as sour as the other kind. 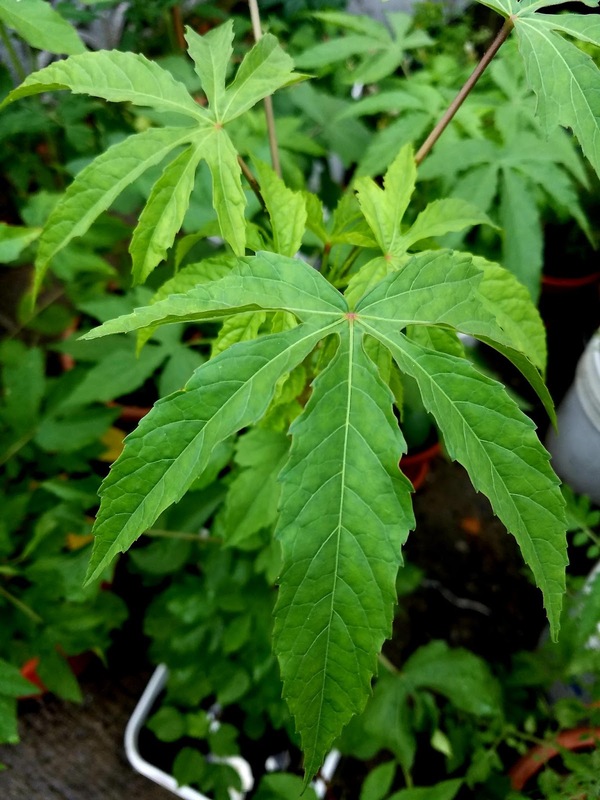 We haven't tried growing this plant before because of the hot climate that is required for its sustenance. I'm happy that the plant is doing well and is growing in our warm climate. We've collected enough leaves to make this popular pickle from India. 1) Add one teaspoon of oil to a medium saucepan on low-medium heat. Next, add coriander seeds, black gram lentil, chilies and Fenugreek seeds. Fry until lentil is golden brown. Then, transfer the mixture into blender and grind it into powder and add half the amount of salt. 2) Bring the saucepan back to the stove and on low-medium heat, add half teaspoon oil and then add the gongura leaves. Wilt the leaves until they turn dull green. Remove from stove and allow the leaves to cool down. 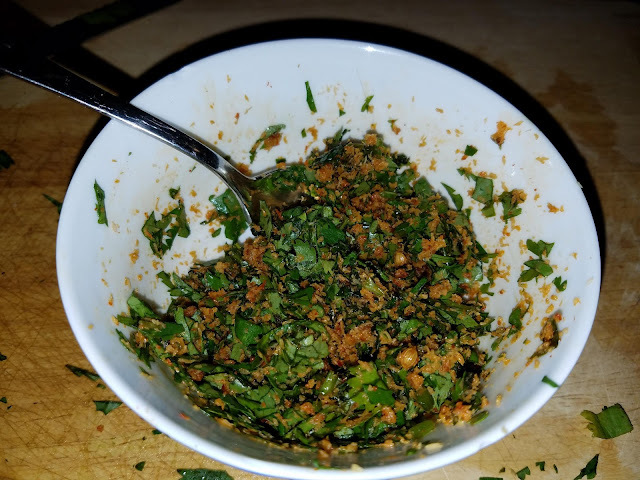 3) Add the wilted gongura leaves, soaked tamarind and remaining salt into the blender with the dry powder. Then, add 1/4 cup or less of water and some oil and grind everything until the leaves are coarsely ground and blended with the dry powder. Transfer the pickle into a mason jar with a lid. 4) Heat the remaining oil for seasoning in the saucepan and add mustard seeds, Fenugreek seeds and red chili. When the mustard seeds splutter, add 2 pinches of hing and then add this mixture to the pickle and mix well. 5) The pickle is now ready to be served. 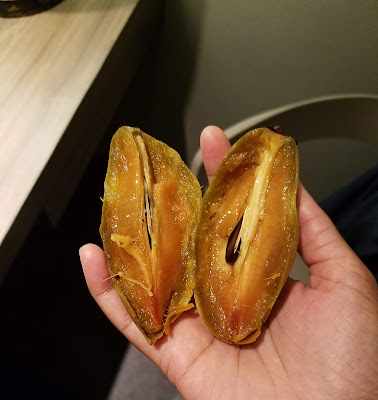 We like to eat this pickle with warm plain white rice. You can also enjoy by spreading it on toast. If you are using red stemmed gongura leaves, adjust the tamarind as it is more sour than the green stemmed variety. If you prefer more gongura taste, reduce the coriander and black gram lentil quantities. 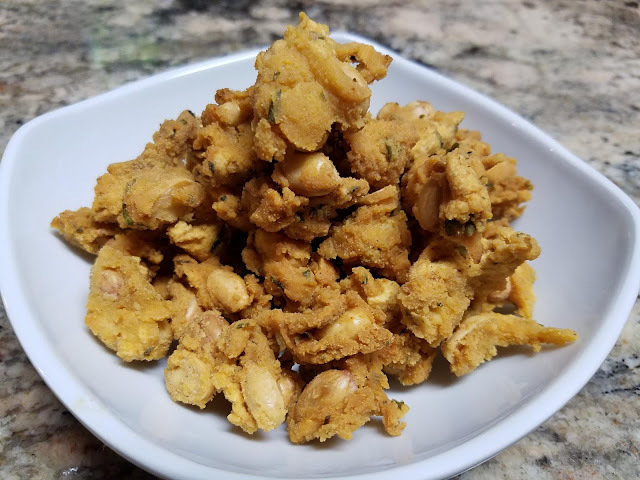 For father's day, my mom made one of my dad's favorite snacks, peanut pakoda. Because my father REALLY likes nuts and nutty snacks. He has a Costco sized nuts box at work and at home. I've gotten his routine down packed: After he gets home from work, he usually gets a handful of nuts and eats them while he enjoys a hot cup of tea or coffee. He also likes cookies with nuts. I wish it was daughter's day...I couldn't stop eating these pakoda. They were so good. Don't take my word for it, try the recipe for yourself and let me know. 1) Using a medium size mixing bowl, mix together: besan, rice flour, chili powder, hing, and salt. Warm the oil for dough (about 3 Tbsp) and add into the dry mixture and mix well. 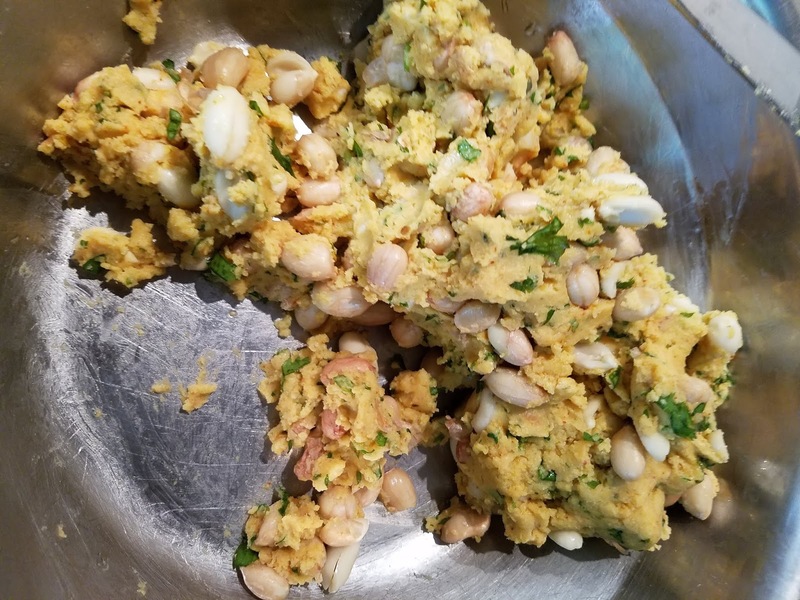 2) Now add ginger-garlic paste, crushed green chilies, coriander, and drained peanuts. And mix well. 3) Add water little by little mixing the dough to bring it all together. The dough should hold all the ingredients and somewhat dry but not crumbly, like cookie dough. Taste a pinch of dough to adjust salt and chili powder to your liking. 4) Heat oil for frying in a frying pan (or wok) on low to medium heat. When you feel the heat on the palm of your hand, test it by adding a small morsel of dough. If the bubbles start immediately and the dough floats to the top, the oil is ready for frying. 5)Take a lemon sized piece of the dough in your hand and bring small morsels of dough between your thumb, index and middle fingers and drop them into the oil slowly. Make sure the peanuts are included in every bit. Add 10 to 15 morsels (pakodas) at a time and fry them on low heat until golden brown. Collect them with a holed ladle and drain excess oil. Next, transfer in to mixing bowl that has a paper towel in it to collect any extra oil. 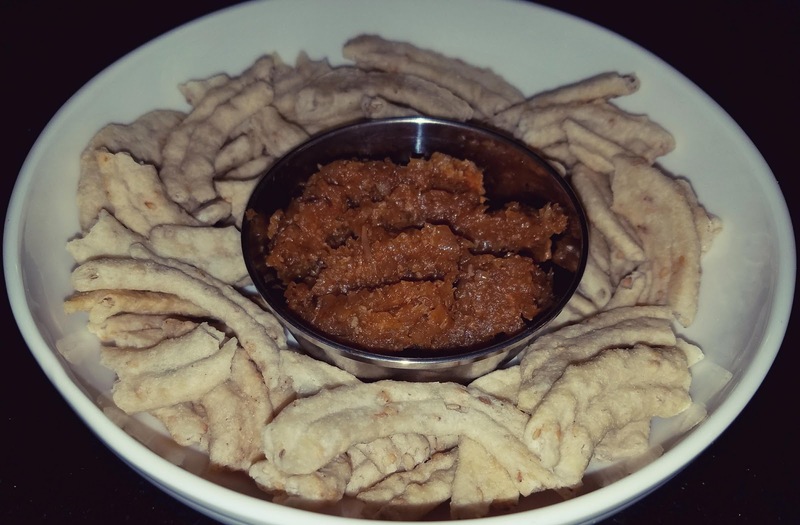 6) Sprinkle some chat masala on the hot "peaNutty pakodas for a more chat-pata taste. 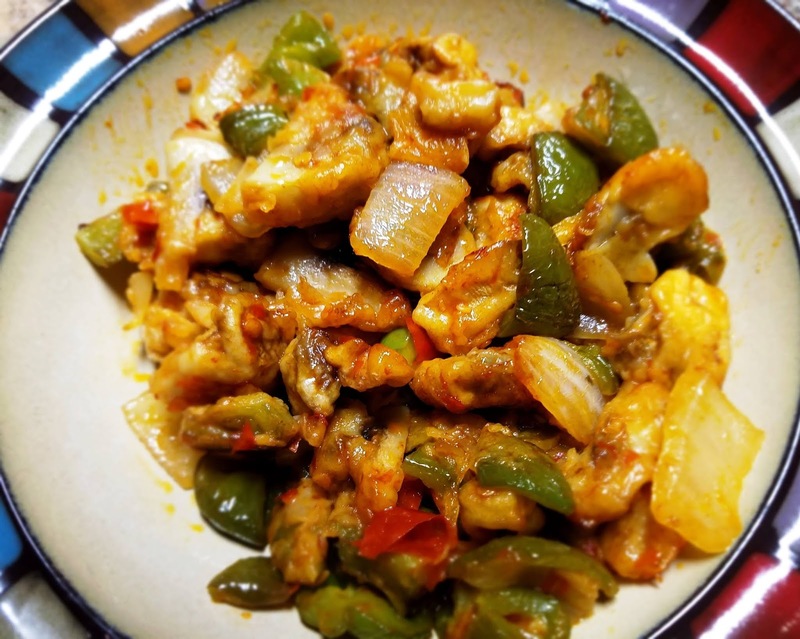 Did you like this recipe? You'll go "nuts" for these other Indian snacks: Corn Flakes Mixture, Indian Trail Mix, Peanut poppers, Crunchy Cashews, Pappuchekkalu . My husband and I took my dad out for dinner a week before Father's day since we were going to be in town. We decided on Ming II in Morristown. It's a Pan Asian restaurant which serves a mix of Indian and Chinese dishes. I always a new dish so, this time I ordered Thai fried rice but I was a bit disappointing. I felt that it lacked flavor. The best dishes of the dinner were Eggplant in Szechwan sauce, Pad Thai and Shrimp curry. 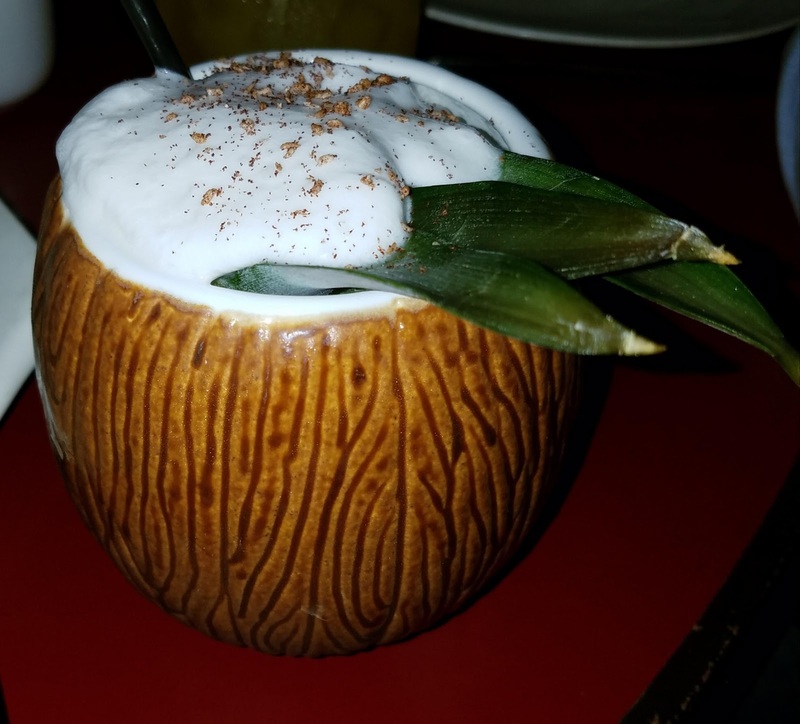 Although I didn't enjoy my dish as much, I really enjoyed my boozy drink...I can't remember the name of it and can't find it on the restaurant website to share with you all. It was smooth and delicious. Actually, we all ordered drinks that night and enjoyed them a lot. My mom, ammamma and my husband ordered spicy mocktails and my dad got a glass of Riesling. Since I celebrated with my dad the weekend before, my sister celebrated with him the weekend after. She took the whole family bowling and as I hear it, my mom placed second. Wonder how my dad did? After bowling they enjoyed some home cooked food. 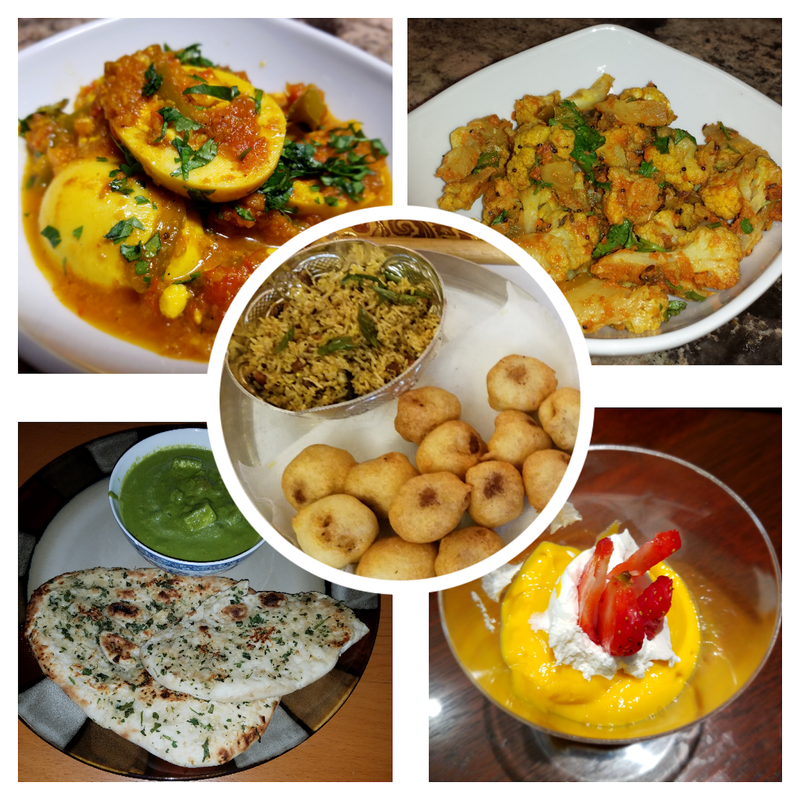 My mom made some of my dad's favorite dishes including Dahi Vada, Pea'Nutty Pakoda, and Aloo Papdi Chaat. Just over the Hudson, I was celebrating Father's day with my husband and his family. We went out for lunch at a new seafood buffet restaurant called Ebuffet in Brooklyn. First impression: it's spacious, still has the new feeling, friendly staff, and good food...even for a semi vegetarian like me. I celebrated father's day with so many fathers this year...my father, my husband, his father, and my sister-in-law's husband. So much to be thankful for...good food and good company. Happy Father's day to all those celebrating! The most important thing in the world is family and love. 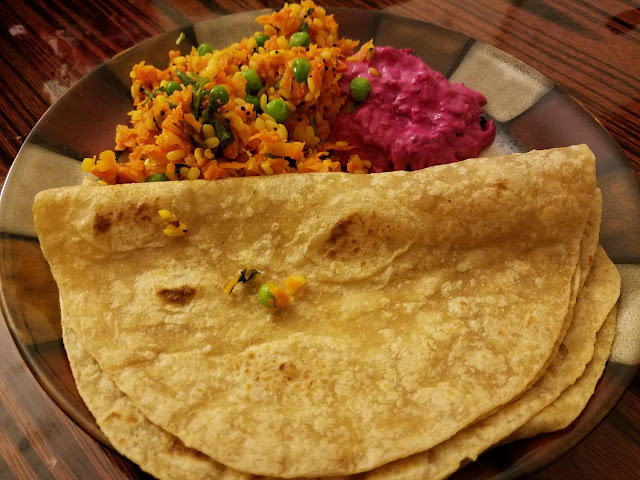 I love eating stuffed dosas with peanut chutney. 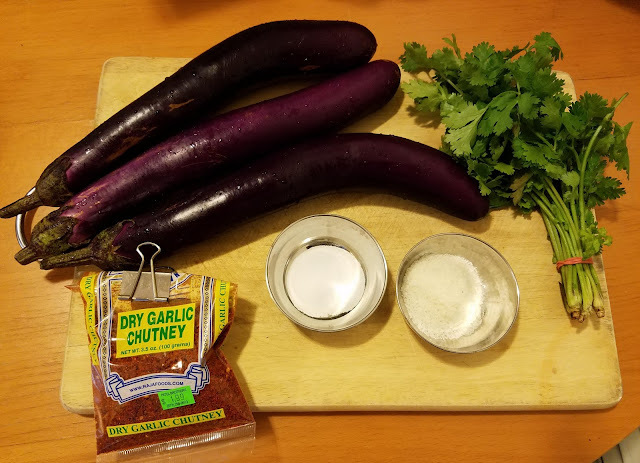 However, none of the South Indian restaurants ever serve the dosas with this chutney. They always serve them with coconut chutney and sambhar and potato curry, which is stuffed inside the dosa. The curry is always bland. It tastes like they just boiled the potatoes, mashed them up and mixed with some spices. It doesn't complement the dosa at all. 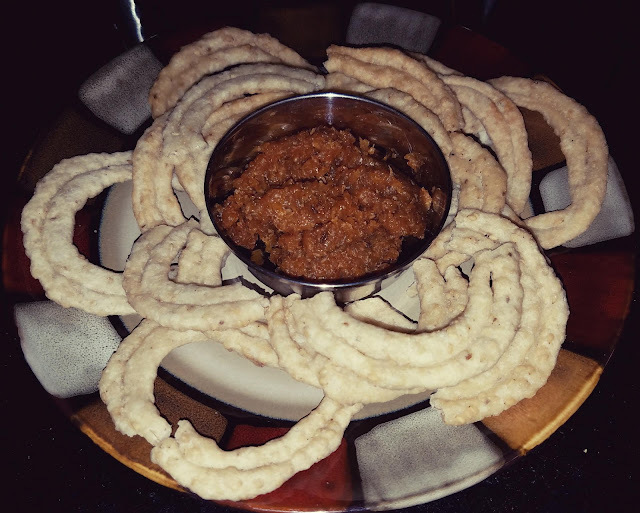 It's been brought to my attention that peanut chutney is only made at home and never served at restaurants. I wonder why? It's so good. 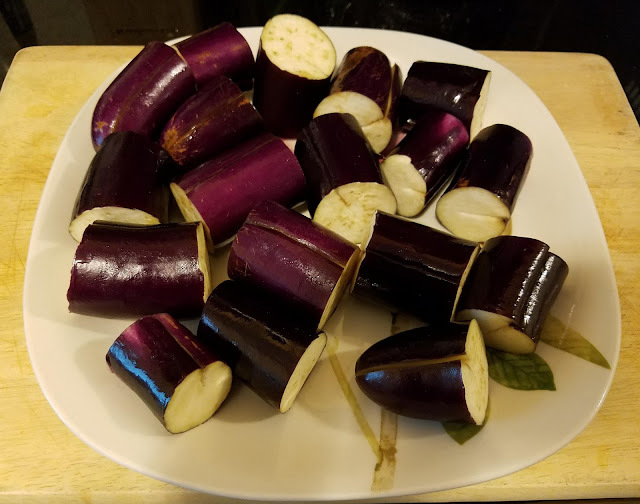 I was so sick of eating the "bland" potato curry, that my mom decided to make her own, better version. No need to give our money away to the restaurants who can't even make a decent curry. 1) Heat oil in a large saucepan, add urad dal, and fry for 1 to 2 minutes. When they brown, add mustard and cumin. When the mustard and cumin start to splutter, add turmeric powder, onions, and green chilies. Sauté for 1 to 2 minutes and add tomatoes. Sprinkle a pinch of salt, mix well and allow it to cook under the lid for 2 to 3 more minutes. 2) When the tomatoes are cooked, and form a gravy, add potatoes, beans (pre-cooked in microwave for 4 minutes), carrots and cauliflower. Then add salt and cook for another 12 to 15 minutes under closed lid mixing every couple of minutes. 3) When the potatoes are cooked or soft (can be cut easily with the spatula), remove the lid and allow any remaining water to evaporate. Mash the potatoes slightly for curry to come together. Taste to adjust salt and spice level. 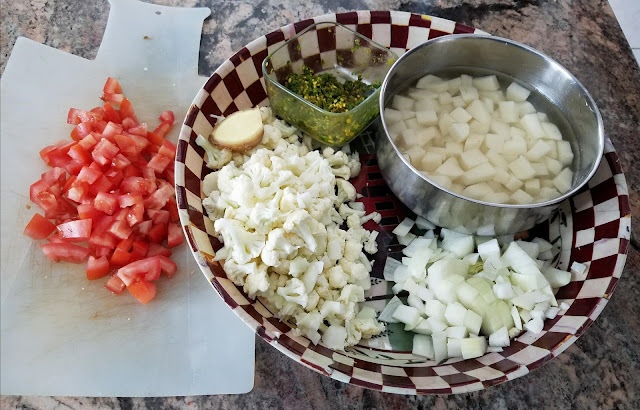 4) Transfer into a bowl and garnish with chopped fresh coriander and serve hot with dosas either as a filling or alongside. - Potatoes can be replaced with grated paneer and will be added when veggies are half-cooked. 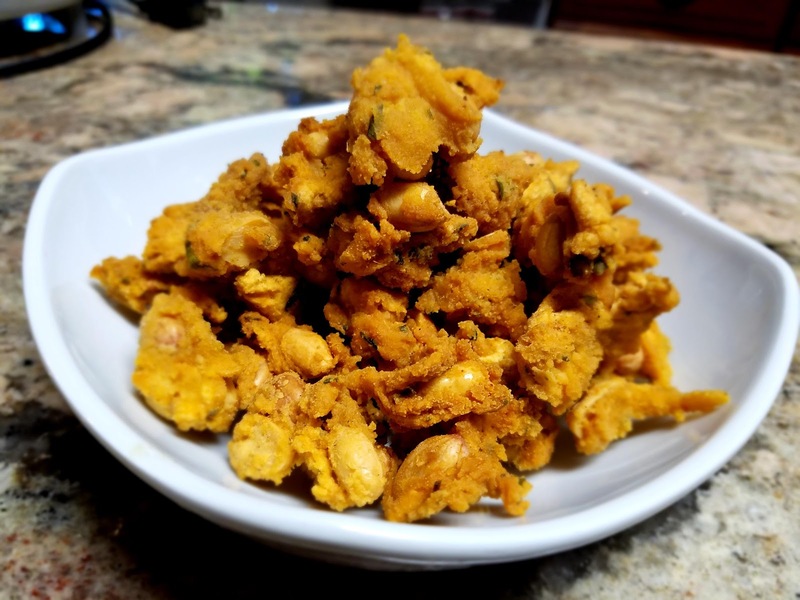 - Fry cashews and add to the curry in the end to give a crunchy taste. Looking for game day appetizer ideas? Expecting company? I love making vegetable raitas or yogurt dips for guests. There are so many varieties you can make. 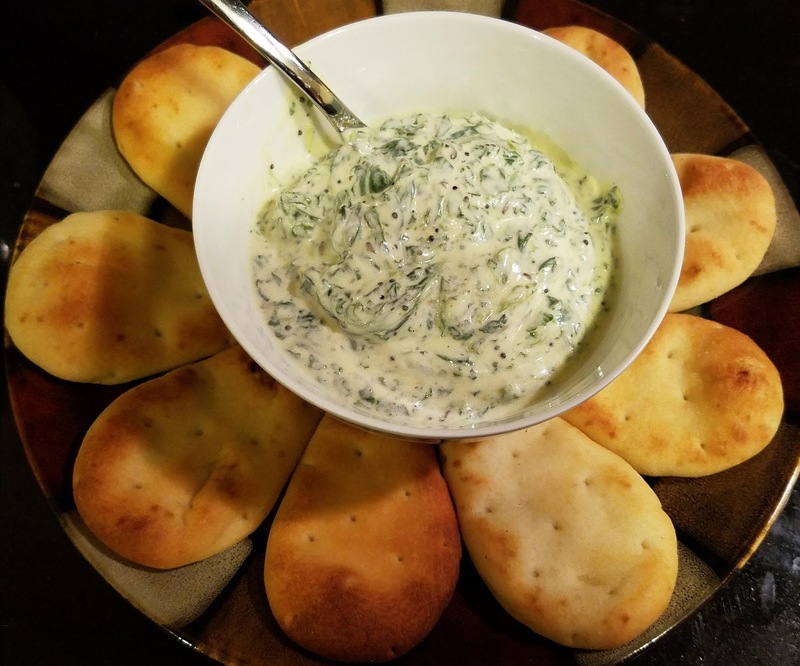 The picture above is spinach raita with naan dippers by StoneFire Naan. I LOVE StoneFire's naans. They have different sizes; these bite size naans are great for dipping into your favorite dip or sauce. I also the texture; they crunchy and the flavor is on point. My husband and I hosted our first game night at our place a couple of weeks ago. 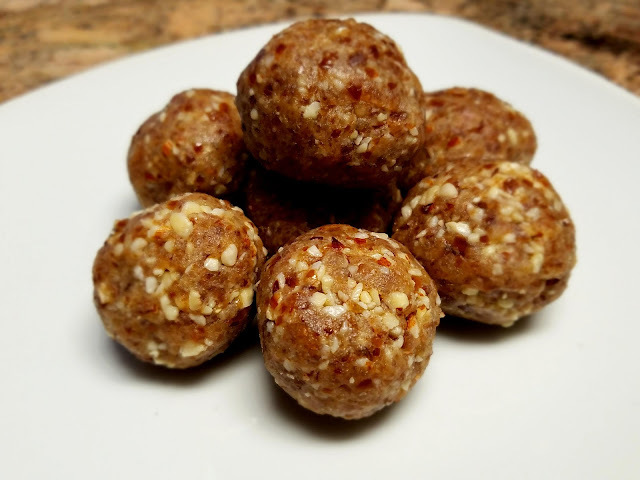 I was trying to figure what snacks I can make using the ingredients I had at home and ones that are healthy; not too fattening. I searched my fridge and found yogurt. I always have yogurt on hand because I love yogurt and it's healthy (good probiotic). I decided to make spinach raita and serve it with the naan dippers. 1) Break the spinach into pieces and transfer it into a microwavable container. Then add salt, chili powder, turmeric powder and microwave for 5 to 6 minutes or until the spinach is fully cooked. 2) Allow the vegetable mixture to cool for 10 to 15 minutes and then stir in the sour cream and yogurt. 3) In a small saute pan (or mini nonstick egg fry pan) heat one tablespoon of oil and add mustard and cumin seeds. When they start to splatter, add curry leaves, and mix well. 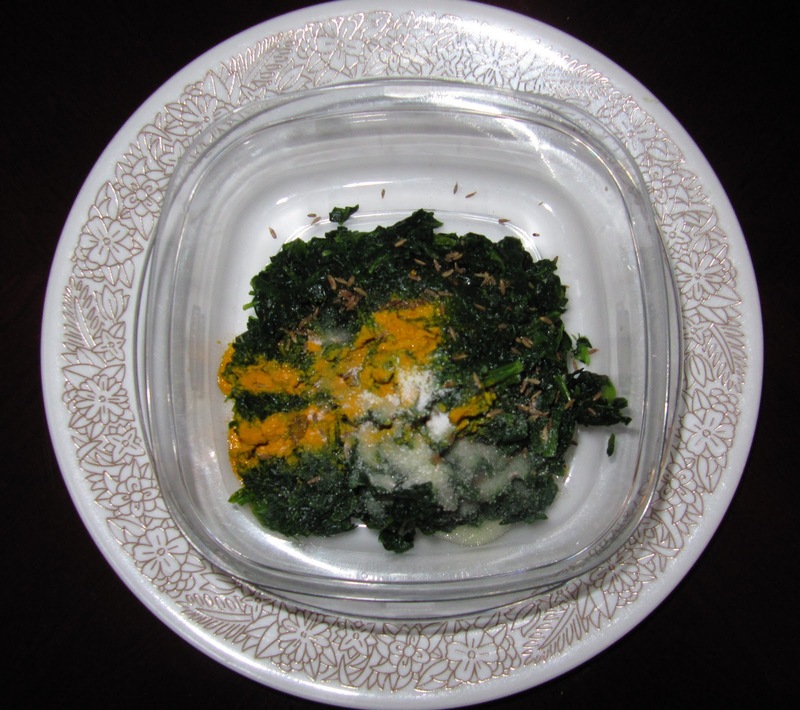 Remove from heat and transfer the contents into the raita (spinach and yogurt mixture) and mix well. Finally transfer into your favorite serving dish. 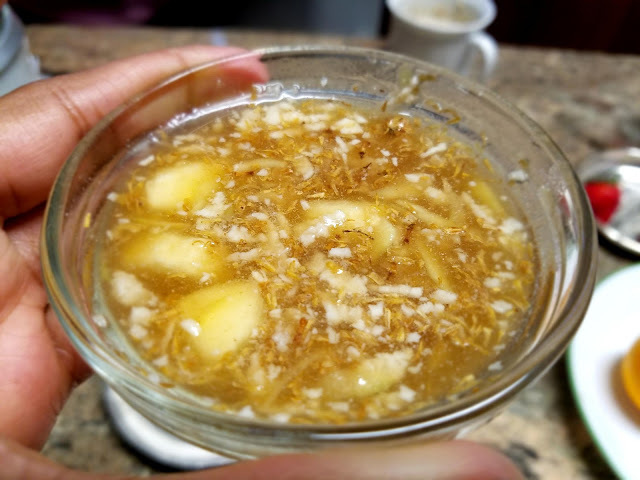 Raitas can be served with pulao, parathas, naan, or plain rice. They can also be used as a dipping sauce for some appetizers like nachos, tortilla or pita chips. 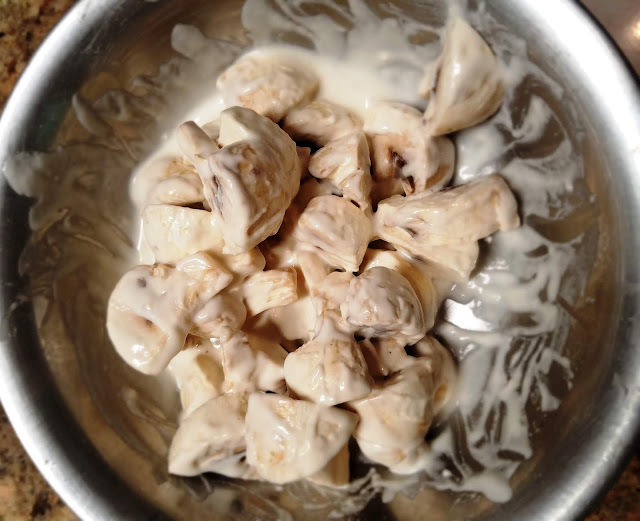 - If you want a thicker dip, add more sour cream and yogurt. - You can adjust the spice level as per your taste. beetroot, green bell pepper, tomato and onion, eggplant or cucumber. We have other yummy snacks that would be great for game day. 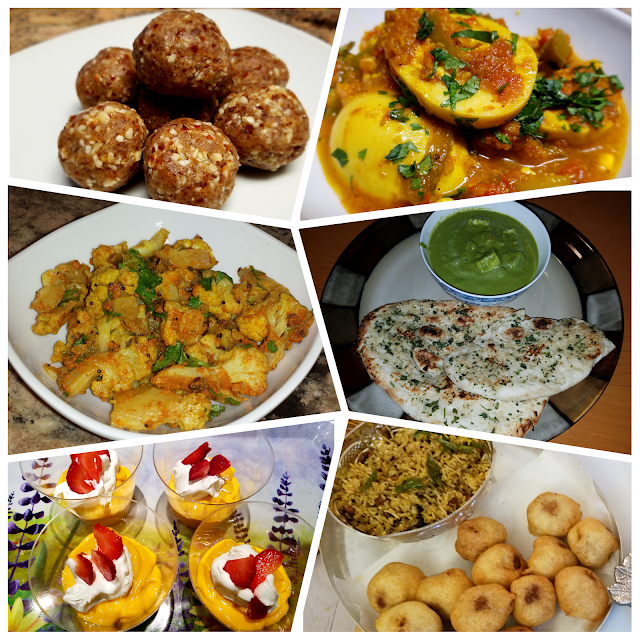 Check out our recipes page for ideas.